The Rebel Sweetheart. : Sneak Peek | Laneige x YCH Collection. Sneak Peek | Laneige x YCH Collection. Be still my heart, this year's Laneige Meets Fashion collection is out and oh-em-gee, the packaging alone is as pretty as can be! Laneige Meets Fashion, year 4! 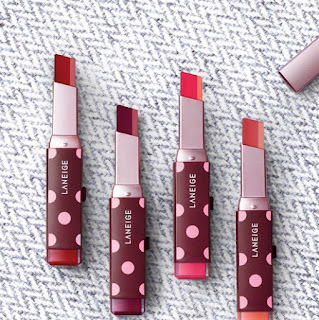 A yearly project, Laneige Meets Fashion aims to fuse Laneige with fashion designer's inspiration including collection story, product concept, and design to create an exciting, specially-packaged makeup range. This year, the popular K-beauty brand teams up with Korean fashion designer Yoon Chon Ho, who is well-loved by celebrities and has had quite a career when it comes to fashion, having worked with some of Korea's top labels before establishing his own fashion brand, YCH. Some pieces from the YCH Fall Collection. Inspired by the modern glamour of the 80's, the Laneige x YCH Collection features classic herringbone and retro polka dot prints - hip, trendy, and definitely edgy. View the entire collection after the jump! 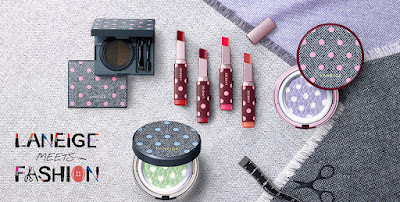 Appealing and eye-catching, this limited edition collection includes the Skin Veil Base Dot Cushion, a colour-correcting base that blends seamlessly into the skin. This product has recently been reformulated and is now infused with WaterBank Essence ingredients for enhanced brightening and moisturizing effects. Laneige Skin Veil Base Dot Cushion, 32000 won. The Skin Veil Base Dot Cushion is available in two shades - Light Purple and Light Green. Skin Veil Base Dot Cushion shades. Also included in the collection is the Eyebrow Cushion Cara, a brow kit designed to amp up your brow game. Its unique formulation has a liquid to powder texture which is resistant to sweat and water, and lasts practically all day long. 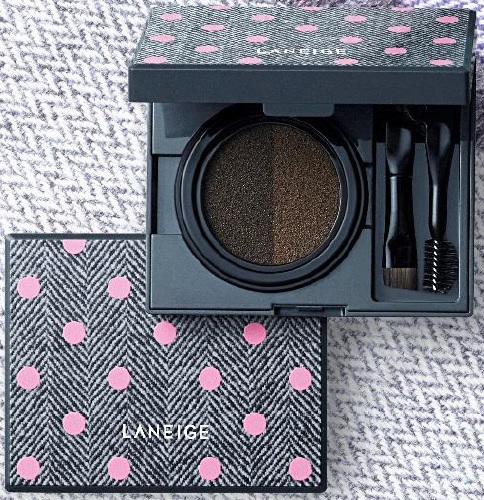 Laneige Eyebrow Cushion Cara, 25000 won. The kit comes with a foldable dual applicator and is available in two shades - Two Tone Gray and Two Tone Brown. Eyebrow Cushion Cara, 25000 won. Finally, we have the Two Tone Matte Lip Bar for that perfect gradient lip look with a matte finish. Featuring an innovative combination of highly pigmented matte colors and a velvety lip primer, the Two Tone Matte Lip Bar presents a natural two-tone gradation that eliminates dryness on the lips. Laneige Two Tone Matte Lip Bar, 25000 won. These all-new lip bars come in four different shades, each shade utilizing fine micro pigment particles for intense pigmentation and long-lasting color. The lip primer, on the other hand, prevents the lips from flaking and drying. It also fills and coats imperfections on the lips for that flawless, soft matte finish. Shade options: Burgundy Mood, Red Cashmere, Power Shoulder Pink, Fitting Rose. Shade reference, click to zoom. I love the brow kit and the matte lip stick. The cushion part of the compact is also very attractive and makes it look sophisticated. Wish I could get it here though? I love the lipsticks that they have, I came across similar ones from a different brand in Japan and I instantly loved it! It's such a nice look if you don't want heavy looking make-up! I like the unique look of this makeup. This would be great for a collector. Seoul Searching | Seoul Museum of History. How to Get Rid of Your Wrinkles in 45 Days. Seoul Searching | Gwanghwamun Square. Sneak Peek | Missha x We Bare Bears Collection.